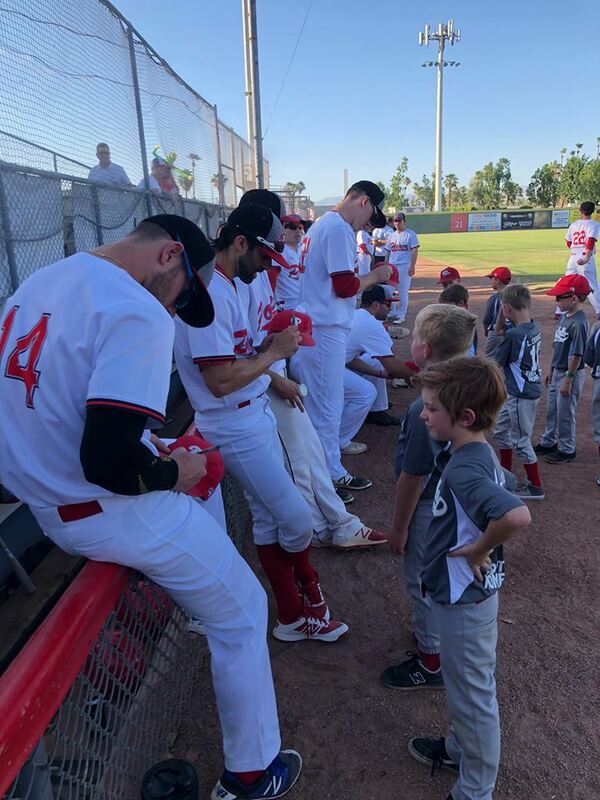 A packed Palm Springs Stadium saw the POWER offense come alive late Friday evening to seal an opening night victory over the SoCal Halos, 10-1. The game remained close through six innings, with both pitching staffs holding the opposition’s offense in check. Then the Halos pitchers lost control of the strike zone, allowed two runs in the 7th before walking five POWER batters and plunking two in the 8th, en-route to a six-run inning for the POWER and sealing the victory. POWER left fielder Chris Dunn (New Mexico) led the charge on offense for the POWER, going 2-3 with a double, two walks and two RBIs. Josh Hernandez (College of the Desert) and Matt Green (St. Mary’s) each added two hits and scored a run in the winning effort. Eight of the nine POWER batters in the starting lineup scored a run in the game. Starter Jack Carberry’s (Western Illinois) control waivered at times, but he battled through five innings, only allowing one run on four hits and five walks, while striking out three. The POWER bullpen was lights out following Carberry, allowing no runs over the final four frames. Alex Strizak (Point Loma Nazarene) came in for two innings and struck out all six batters he faced, followed by scoreless innings from Cameron Sepede (UNLV) and Darin May (Cal Poly Pomona) to close out the game. The POWER will wrap up their two-game set with the SoCal Halos tomorrow night, with first pitch from Palm Springs Stadium at 7:05.